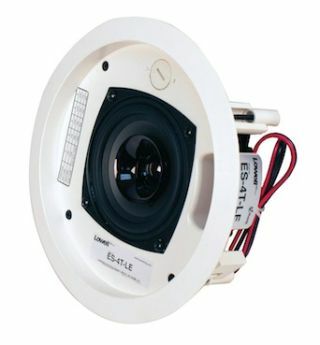 Lowell Manufacturing Company, a U.S. manufacturer of professional AV products, has introduced new UL Listed “LE” versions of the ES Series in-ceiling speakers. The LE designation—“less enclosure”—indicates that the speaker and its rough-in enclosure components are delivered as separate items. This allows AV specialists to install the enclosure/bridge assembly during the rough-in stage of new construction, allowing for accurate speaker pre-wire and placement. This eliminates the need to cut speaker mounting holes after drywall is in place and has been painted. This approach is also fiscally efficient because the integrator does not have to absorb the full cost of the speaker package at the beginning of the installation process. At the appropriate time, the mounting bezel, speaker, transformer, and grille package can be purchased and installed creating an architecturally pleasing and great-sounding end-result. The ES-62T-LE (with 6.5-inch coaxial driver) and ES-4T-LE (4-inch dual cone, full-range driver) produce excellent intelligibility for speech and full-frequency response for music, making them ideal for retail, commercial, industrial, institutional and residential applications. These recessed in-ceiling speaker systems provide the kind of crisp, high-frequency response that’s expected from high-quality speaker systems. The speakers’ wide dispersion can actually reduce the number of speakers required to produce even coverage in distributed speaker systems.